One of my blogging resolutions was to post more recipe fails, just because they’re funny and sometimes instructive. This doesn’t qualify as a fail, though it’s a recipe that could stand to be improved. 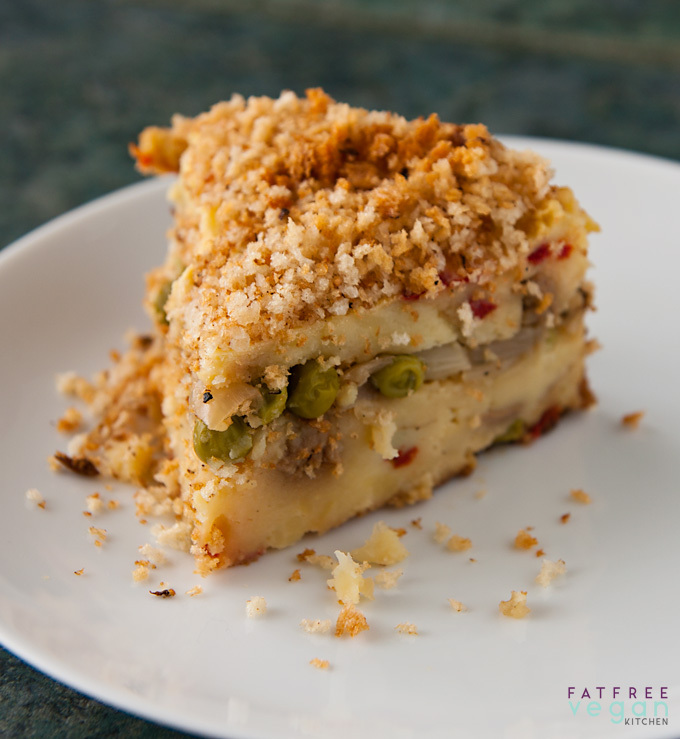 It’s a veganization of a recipe in The Italian Country Table for “Gatto” Di Patate, a layered potato casserole. The original recipe (conveniently posted here) includes a quarter pound of salami, a cup of Parmigiano-Reggiano cheese, and a half pound of mozzarella. When I decided to veganize the recipe, I noticed the animal products, of course, but I failed to take into account how much of them there were. Also, I concentrated my efforts on making up for the strong flavor of the salami without considering the creaminess of the cheese. I used porcini mushrooms and roasted red pepper to make up for the song flavor of the salami and nutritional yeast in the potatoes to add a little of the cheesiness of the Parmesan. Those were fine substitutions (though I think that sundried tomatoes might pack more punch than roasted peppers), but I probably should have gone a little further and substituted something for the mozzarella that originally topped the layer of onions. The casserole was a little on the dry side and would have benefited from some cheesiness. So, what I recommend, particularly if you are cooking this for guests (or picky family members), is this: Top the layer of onions with a cheese sauce such as this one. If you are not following a fat-free eating style, consider using one of the packaged vegan mozzarella cheeses. And adding a little diced veggeroni or soy pepperoni to the potatoes would really make the veganized version more like the original. Like I said, though, this wasn’t a bad recipe; my husband D and I ate it all, over several days. E wasn’t thrilled with it, mainly because she doesn’t like bread crumbs on anything. The crumbs are heavily garlic flavored–I used 2 cloves–so if you don’t like garlic, definitely use only 1 clove. If you’re following Eat to Live or Weight Watchers’ Core plan, you can even leave the breadcrumbs off (though they are what D liked best). 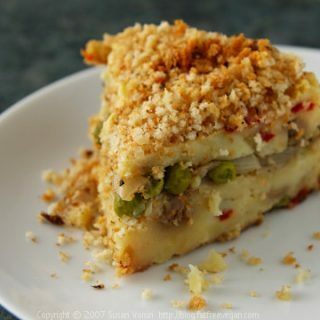 “Gattô” comes from the French “gâteau,” meaning cake; think of it as a layered cake of potatoes. Put the potatoes in a large pot, cover with water, and simmer 25 minutes or until tender all the way through (pierce with a fork to check). When they’re done, dip out 1/2 cup of the cooking water and drain. While the potatoes are cooking, rehydrate the porcini mushrooms according to package directions. (I cover them with hot water and soak for about 25 minutes.) When they are completely rehydrated, drain them, reserving the liquid, and chop coarsely. Strain the soaking liquid through a coffee filter or fine mesh strainer and set aside. Heat a non-stick skillet. Add the onions and sauté until they are browned. Sprinkle them with salt and pepper to taste, then remove them from the pan. Add the minced garlic and panko to the hot pan. Cook, stirring constantly, for about 3 minutes or until the panko has browned slightly. Sprinkle with salt and pepper to taste and set aside. Mash the potatoes in their skins until slightly lumpy; then stir in the soymilk, nutritional yeast, roasted red pepper, diced porcini mushrooms, and half of the peas. If the potatoes seem dry, add some of the mushroom liquid and/or potato water. You want them to be fairly moist. Season to taste with salt and freshly ground black pepper. 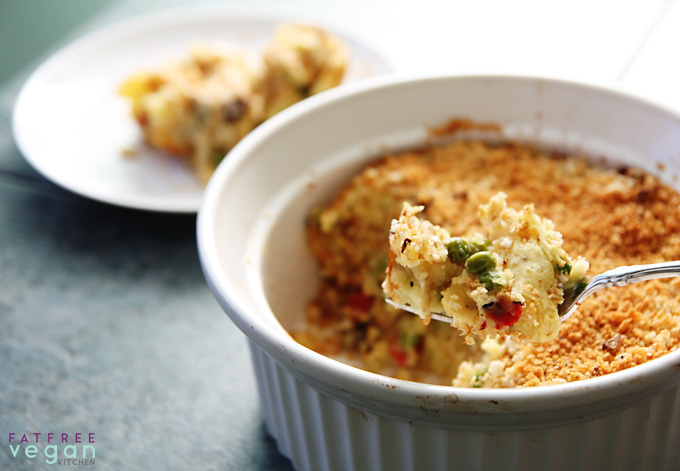 Spray an 8-inch casserole dish lightly with olive oil or use a silicone baking dish. Spread half of the potato mixture into the dish, followed by the remaining peas and the onions. (Add "cheese" sauce now, if you'd like.) Top with the rest of the potatoes, smoothing the top. Bake for about 25 minutes, or until hot throughout. Top with the bread crumbs, pressing them into the potatoes slightly. Bake another 10 minutes and serve. I recommend adding a layer of cheese sauce on top of the onions and peas. Some of my favorites are the sauce from macaroni and cheese, cauliflower cheese sauce, and chickpea cheese sauce. If you want, you can stir some into the potatoes, too. Well that’s a new twist I must say, a food blog striving to share bad recipes??? I just want to say how amazing you are! You are such a generous person, sharing your stories, fabulous recipes and spreading the word about healthy cooking! My hubby and I adore you! I am very grateful for your recipes! I find myself going to them over and over, always finding something new and exciting to try. The results are delicious – consistently! Thanks for such a vast & yummy selection of goodies! Potato Gatto is one of the few foods mentioned in the Neopolitan Novels by Elena Ferrante, While about Naples and Italians, the novels aren’t at all about food. A mother in law cooks it especially for her future son in law. Which is why I googled potato gatto. Thanks for your nutritionally conscious take.